One coat of Ludurana Flash flaky topcoat over two coats of Layla Magneffect in Golden Nugget. I think the red/green/gold color of the flakes accent the greenish-greyish color of Golden Nugget nicely. Next time I'll use a different flaky polish to give it a little more oomph, as the Ludurana flakes are very sparse. 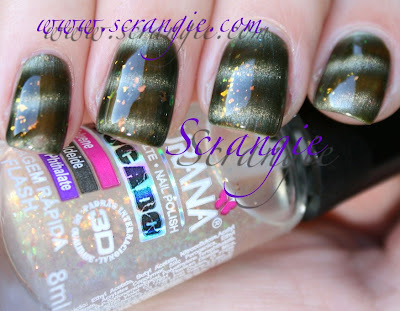 Interesting--I wouldn't have thought to combine the flakies with the magnetic stripes--looks very exotic! KarenD, I was curious to see if it would enhance or ruin the "3D" look of the magnetic, it turned out differently than I thought but I like it! i must try this now! thank you .! Looks good :-) i have just managed to track down the 17 magnetic polishes, can't wait to try them out. I love layering experiments like this! Oh I love it. Seriously need to find magnetic polish around here! I love the flakies of Ludurana. I think too sparse the flakies, but looks good with two coats. Like the combinaiton. Very pretty. even i bought one nail polisg from Layla, it-s amazing, I put one foto on my blog! you polish review are always the best!! I've two of the Ludurana flakies -- Trovao and Vento. They *are* very sparse indeed but nice. Though the swatch photos I saw in a couple of places made these shades look completely different, to my eye the results are basically identical...both are emerald green to blue. Gorgeous, but I'm giving one away to a friend and hoping somebody else comes out with more flakies that aren't dupes of that same green/gold/orange/red Nubar 2010 look. I like it though, my issue with the magnetic polish when I wear it is trying to stop it chipping! I never would've thought to put a flakie over a magnetic polish. But it looks really interesting together! That is such an awesome combination! <3 it!